The project began with Big Dog Demolition separating the Macy’s store from the existing Mall structure prior to the demolition process. A temporary barrier was then constructed with metal studs and gypsum product to create a barrier wall, so that patrons would not be disturbed throughout the demolition process. Once this stage was complete, steel sheers were then used to dismantle the concrete and steel structure. 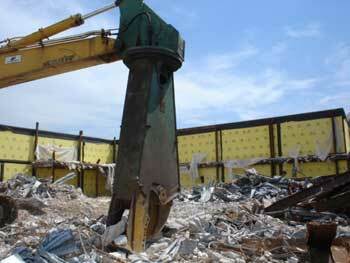 Approximately 280 tons of steel were recycled from the project. All masonry products will be recycled and used for road base at local Atlanta landfills.